Ahead of a strategic visit by Russian President Vladimir Putin to Shanghai next month, Chinese and Russian officials have met to lay the groundwork for expanding already-robust energy ties. 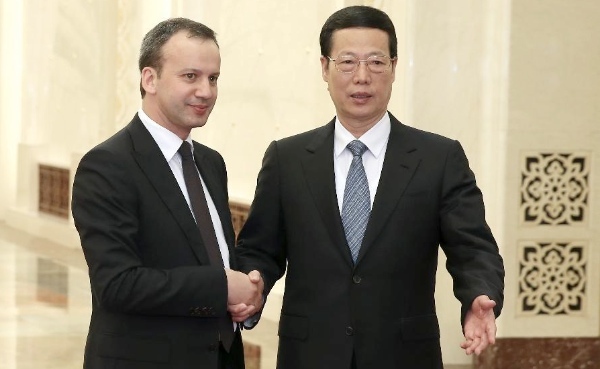 Chinese Vice Premier Zhang Gaoli and Russian Deputy Prime Minister Arkady Dvorkovich met in Beijing on Wednesday under the aegis of the China-Russia energy cooperation committee. The Russian Deputy Premier said he hoped a 30-year deal to supply pipeline gas to China would be signed during Putin’s visit to China in May. China and Russia are the biggest consumer and exporter of energy respectively. “We hope to conclude the contract in May. The base price is the only problem to be solved,” Russian agency ITAR Tass quoted Dvorkovich as saying. His Chinese counterpart told reporters that Wednesday’s meeting was aimed at implementing the consensus reached between the presidents of the two countries and preparing for their meeting in Shanghai. Russian gas monopoly Gazprom Chief Executive Officer Alexey Miller also met China’s National Petroleum Corp. Chairman Zhou Jiping in Beijing yesterday to discuss the contours of the deal. Putin is scheduled to visit China in May and attend the summit of Confidence Building Measures in Asia. The Chinese Vice Premier said yesterday Moscow and Beijing are “reliable and priority partners”. The two sides are expected to work on increasing oil supply, promote the Tianjin refinery construction, construction of a pipeline to carry 38 billion cubic metres (bcm) of gas a year, said Zhang. Russia is looking eastwards for energy exports due to the slowing demand from Europe as well as the standoff with the EU over Ukraine. Moscow and Beijing signed 21 trade agreements, including a new 100 million metric ton oil supply deal with China’s Sinopec during a state visit by Russian Prime Minister Dmitry Medvedev in October last year. The new world economic order is upon us.